Last year my Allium 'Schubertii' blooms were the talk of the neighborhood and I was glad that people appreciated them as much as I did. I decided that I would add more Alliums since everyone enjoyed their shape and color, this year I added 'Purple Sensation' to the garden and while the flowers are smaller (than 'Schubertii') and right now only being appreciated by me and a couple of bees I'm pretty pleased with them. If I'm not mistaken I bought these from the Home Depot garden center last fall for $3.96. The package said they could go in full sun, but I'm thinking that full sun combined with Chicago area wind may be causing the tips to brown a little. If I move them or add more of these I'll place them in an area where there is more shade. The bee count in the garden has been lower this year but the two bees I've spotted in the past two days have been busy at work pollinating the flowers on these Alliums and most of the plants already have swollen seed pods. I'm going to collect the seeds and germinate them even though the seed are suppose to produce plants with lighter colored blooms. I'm not the kind of gardener to look a gift seed pod in the mouth. And in case you're curious: I took this photo in macro mode in the middle of the day using flash to give me a brighter photo and to capture a little bit of the bee's wings. great bee capture! I have a few here, too, but nowhere near as many as in the past. This is a stunning photo. Nice shot of the little worker. Awesome shot! Love the colombine too! great shot! tell us about the camera sometime. That's just beautiful! My allium aren't blooming yet. I love the bee in action shots. I have some from last fall of bumble bees all over the sedum flowers. Visiting for Green Thumb Sunday. Fantastic alliums! I love these and so do the insects obviously!! 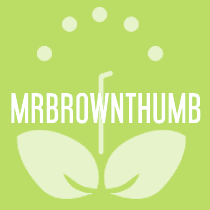 I love the color purple Mrbrownthumb! Your alliums are beautiful and so it the photography. It makes me want to run down to Home Depot. I don't have any allium, but I may have to try them. I had Schubertii last year, but it didn't return this year. :-( You're right, they do create a sensation in the garden! I have Purple Sensation for the first time this year and I'm loving it. I really want to get the even larger allium for next year, but they're so expensive! 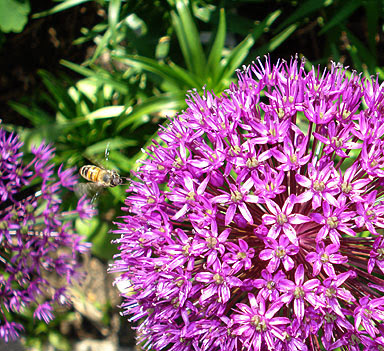 Great photo of the bee and allium! I just love these flowers!!! why do I not have ONE in my garden??? I guess I better check HD tomorrow and see what they have! Please come visit! I love your insight! Oh, and if you would like, I'll save some French Hollyhock seeds for you. All you need is one plant and you'll never go hollyhock hungry again! Thanks for visiting and commenting. Things have been a little busy for me. But I'll be at your blogs shortly. @kylee, I know what you mean I really want the giant ones (Gladiator?) but they cost too much for me. I have a number of seedlings of Shubertii-if they survive the summer you're welcomed to a couple. Sorry to hear about your blog troubles. I'll be by shortly. Amazing shot. Alliums are one of my favourites. I'm going to be posting some of my alliums in the next week or two. We bought a house and planted a ton of bulbs from Brecks last fall. I think we put in like 10 of the drumstick Allium, just like the one in your picture. Most bloomed great. We have many swollen seed pods, but also 2 of them developed these yellow bubble-ish type orbs clustered in the center. Do you know what those are? They looked soft, but when I took them out they fell apart and look more like giant corn kernals now. When do you plant the seed pods? Will they grow in the summer? Do we have to dry them out first? I've never done this before. Any info would be much appreciated. Any way to get bulbs from seed grown plants? Unfortunately I don't know what the yellow orbs are but I'm guessing seeds. I sow these seeds in the winter in my area and allow them to go through the freeze/thaw cycles and then they germinate in the spring. If you aren't going to plant them right away I suggest putting them on something made of paper so they can dry out and be stored until you're ready to sow them. Otherwise they'll get moldy. When the seeds come up they will be one shiny leaf thicker than a blade of gass. I loved your post about the alliums. Mine are forming seeds now, and I want to let them dry so I can plant them. Do you know when the seeds would be ready to collect and sow how soon till new plants will bloom? Haev you gotten new plants from seed? If so, how are the new blooms? You'll know when your seeds are ready to collect when the pods turn brown and start to split open. On one of my other blogs I posted pictures of my seeds from my Allium last year. If you go to that link you'll see the photo of my seeds and seed pod. It will be about two to three years before they bloom. I just plant my seeds where I'd like for them to grow after they seed and they should germinate next spring after they thaw out. Greetings from sunny northeast Florida, Mr. Brown Thumb!! I am planting my first Purple Sensation Alliums. I purchased 5 packages of 4 bulbs at Home depot for $1.39, 6 weeks ago. Since I have so many, I want to plant 4 bulbs in a large square pot. Do you add anything to your Allium soil? 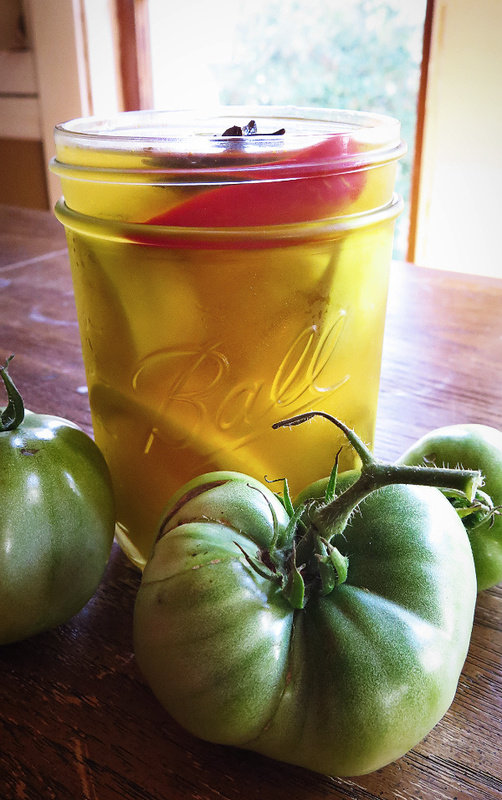 Have you tried them in pots? I have over 100 Amaryllis, all in containers and have had great success with them, incl. forcing them to bloom from Nov. through July. I always add Bone Meal to them & all my bulbs (also good for Zinnias). This year I'm trying Epsom Salt (as per "The Garden Rebel" radio show. Do you think my Alliums will do benefit from these 2 additives? I have yet to plant them in a pot or do much beside the soil a little like you do for your Amaryllis in containers. 100 Amaryllis bulbs must be a sight.